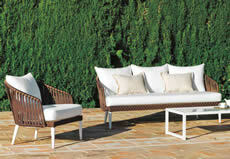 Garden Furniture Murcia Costa Calida Spain. AlfrescoFurnitureSpain.com supply Garden furniture to properties in the Murcia Region of Costa Calida as well as throughout Spain. Choosing the right Garden Furniture can transform your outside space into your idyllic relaxation zone. 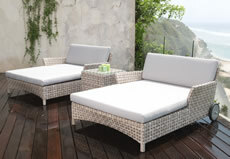 Let us help you choose your perfect Garden furniture to compliment your holiday home. 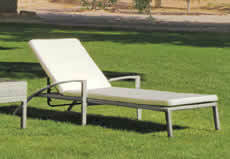 We supply Garden Dining Sets, Sofa Sets, Daybeds and Sun Loungers to suit all requirements and budgets. 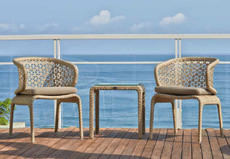 We also offer an extensive range of quality Rattan Garden Furniture as well as the largest luxury, contemporary and aluminium collections in Spain. Contact Us For Best Deals. 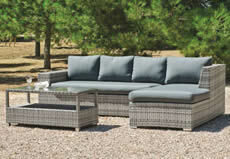 See our new range Garden Sofa Sets. 2019 Sofa & Dining Set Offers. Sun Loungers to suit all requirements. 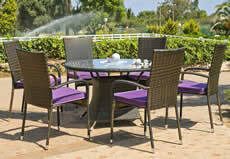 Extensive range of Garden Dining Sets. Choose from 18 Balcony Sets. 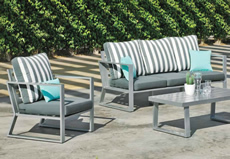 Garden furniture trends and designs are clearly moving towards Aluminium and slick minimalistic modern designs in 2019. Many Spanish manufacturers are leading their 2019 collections with aluminium. Here are a few ranges that have caught our eye and are available for sale now. Menfis 8 Aluminium 3 Seater Sofa Set Price - €2800. (277 x 277 x 80) Available in white, antracita & champagne frame. Menfis 7 Aluminium 3 Seater Sofa Set Price - €2700. (277 x 277 x 80) Available in white, antracita & champagne frame. Coloseo Chaise Sofa Set Price - €3885. (328 x 265 x 95) Solid aluminium frame available in white, antracita and champagne. Bolonia Wood/Aluminium 3 Seater Sofa Set Price - €2270. 2 Seater Sofa Set - Price - €2065. 3 Seater (200 x 84 x 90) 2 Seater (141 x 84 x 90). Foot stool not included. Volga Chaise Sofa Set Price - €1875. (247 x 178 x 76) Solid aluminium frame, Breathable, waterproof foam rubber upholstery, high strength fabric. Ganges Sofa Set Price - €1875. 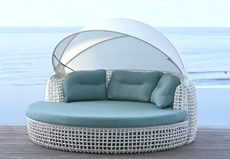 (260 x 146) Solid aluminium frame, Breathable, waterproof foam rubber upholstery, high strength fabric. Look out for our Garden Furniture Special Offers that run on selected dates throughout the year. 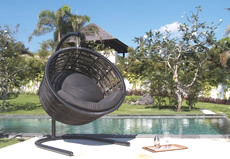 Our offers include Sun Loungers, Rattan Sofa Sets and Garden Dining sets. Our Garden furniture offers include delivery to your holiday home in the Murcia, Costa Calida, Costa Blanca and most regions of Spain. We supply Garden furniture to properties all over Spain including Murcia, Costa Calida, Costa Blanca, Costa Del Sol regions of Spain. All our Garden Furniture prices include delivery and IVA. 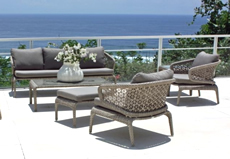 Beautiful Garden Furniture Designs from - Skyline Design, Hevea Jardin de Muebles, Nabab, Point, G&G Italia, Joenfa Agua De Mar. Ciudad Quesada, Villamartin, Los Alcazares, San Javier, Dehesa De Campoamor, Torrevieja, Las Colinas Golf, Mar Menor Golf Resort, Pilar de la Horadada, Torre de la Horadada, San Pedro de Pinatar, Los Urrutias, La Zenia, Cabo Roig, Cabo De Palos, El Valle, La Manga Club, Vista Bella Golf, Los Belones, Mar de Cristal, Los Montesinos, San Miguel de Salinas, La Manga, Hacienda Riquelme, La Torre, Roda Golf, Hacienda Del Alamo, Desert Springs Resort, Ciudad Quesada, Pilar de la Horadada, La Zenia, Santiago de la Ribera, Lo Pagan, Sotogrande, Marbella, Murcia, Costa Calida, Costa Blanca, Costa Del Sol, Costa Brava.